In a recent post, I listed the various types of therapy being used to treat my Parkinson’s. Importantly, I believe in modern medical treatment; a Dopamine Agonist (Ropinirole) has improved the quality of my life. However, I am also using a Complementary and Alternative Medicine (CAM) approach to treat my Parkinson’s. A Bunch of Grapes vs the Substantia Nigra? 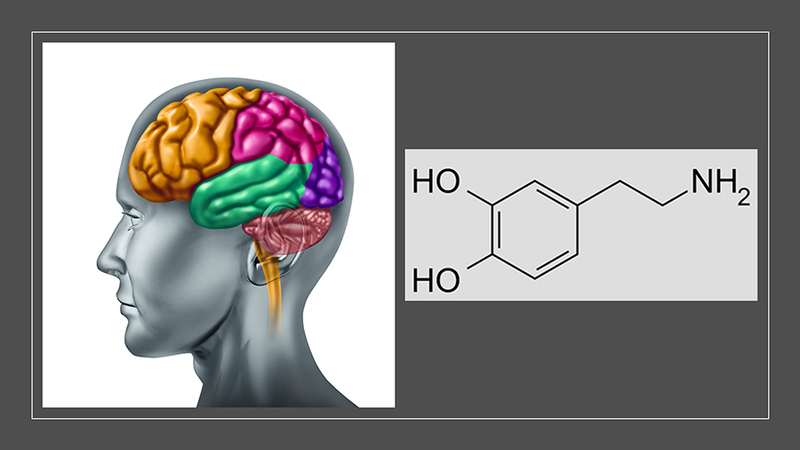 A small region of the mid-brain, called the substantia nigra, is responsible for making the all-essential neurotransmitter dopamine (for more details, go here: http://www.buzzle.com/articles/function-and-location-of-substantia-nigra.html). Parkinson’s begins because the cells in the substantia nigra have died. It takes a ~50% loss of these cells for the first symptoms to appear in Parkinson’s. 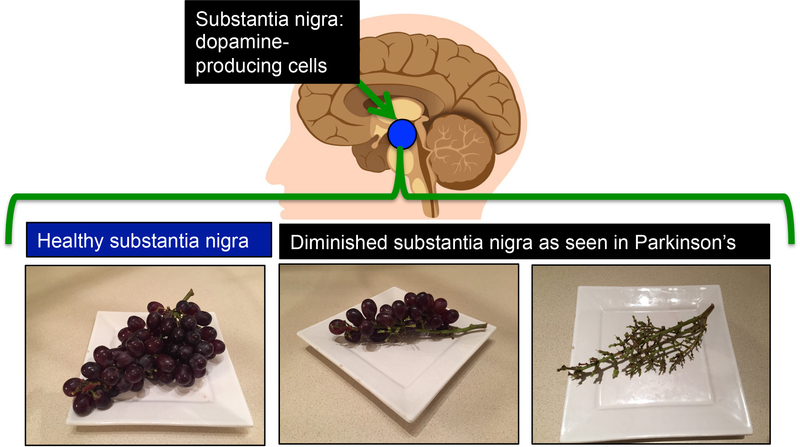 The picture above shows the location of the substantia nigra in the brain, and the bunches of grapes represent the cells of the substantia nigra (left to right 100%, 50% and 0% grapes, respectively). For those of us with Parkinson’s, the goal is simple, do whatever one can do (to try) to preserve the bunch of grapes at the ~50% level (middle panel of grapes, i.e., cells of the substantia nigra). The CAM strategy below has been designed to protect and preserve ‘my bunch of grapes’ for as long as possible. Daily multiple vitamin– A high-potency multivitamin with minerals to meet requirements of essential nutrients. Ubiquinol (reduced CoQ10, 100 mg daily) is the reduced form of CoQ10 (more readily absorbed). CoQ10 is found in the mitochondria (little energy factories) of cells, and it helps produce energy and prevents cell death. It was long thought that CoQ10 could slow Parkinson’s progression. However, new results showed that CoQ10 had no effect on the progression of Parkinson’s symptoms in early-stage disease (http://www.pdf.org/en/science_news/release/pr_1398181054). Compared to many Parkinson’s patients, my list of CAM substances is relatively modest. No doubt, over time, it will change/evolve as I read more and understand Parkinson’s better (I will keep you updated).